At Zion, we understand that every part manufactured for the construction industry needs to be treated with care and precision. So many construction tools and equipment rely on durable, top-notch parts to function in the most efficient and safe manner. When you need heat treating for your construction parts trust the induction experts at Zion. We invest the time to get to know our customers, so you can be sure when we’re providing induction heat treating for the construction industry we’ve carefully considered your exact specifications and any unique requirements you may have. 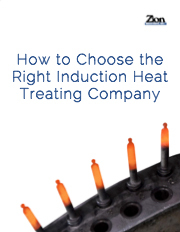 Why choose Zion for your induction heat treating needs? The team at Zion Industries works with our customers, striving to ensure that we not only understand their requirements, but can also help clarify any requirements from a third party print. We pride ourselves in being one of the largest, most innovative, privately-owned heat treating companies in Ohio, Michigan, and North Carolina but we also serve areas such as Pennsylvania, Kentucky and Tennessee.